A Division of Automotive Top & Trim Inc. Proud Winners of the 2011 National Grand Championship! We offer top quality trees for everyone. Experience the beauty of Central Wisconsin while choosing your tree! If you want to pick out your tree or wreath for this Christmas, come visit our retail Christmas tree lot. We offer full-service to give you a special Christmas experience. 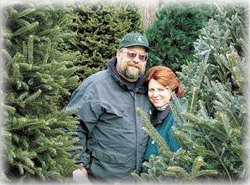 If you are looking for trees to sell -- we offer top-quality evergreens grown on our farm. Tom & Sue Schroeder at their retail lot, December 2005. The Christmas SPIRIT Foundation is committed to keeping the spirit of Christmas alive and growing memories for the next generation of children and families. Your charitable contribution will help needy children and families in the United States during the holiday season, and promote environmental stewardship throughout the year. We are a 501(c)3 public charity, so consult your tax advisor about the deductibility of your gift.